Facebook Tips and Tricks: Bring more business using "Facebook Places"
Bring more business using "Facebook Places"
We have discussed about creating Facebook Fan Pages, business pages, creating Static iFrame tabs, creating video contests, which mainly gave more exposure to the online world for your business. Taking it more forward, if people or your fan page fans are around your business location, then they will not be intimated through just business pages. For that you have to create "Facebook Places" in addition. In one of my posts earlier, I have mentioned about adding "Geo Location" using Google Maps. But this will not intimate the visitors who are in the vicinity of your business location. If people are around your business location building, then using their mobile phone apps, your business details should pop up on their mobile devices. Using "Facebook Places" this is possible. 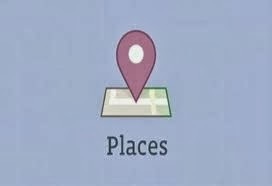 In Facebook "Places" is an application that allows location based feature on your iPhone and other smartphones. Not only for business but also you can see where your friends are by giving your real world location. Using this app, you can check in to the places. Moreover, for business if some events are upcoming then setting your location or places will bring in more public. This post is mainly for business fan pages to set the location or the address of the business. Then using "Places" app, people will get notified about it when they are nearby you office or the exact location. Go to your "Business Fan page "
Note that the details that you entered are correct and they will be updated in the system after few hours. So, when it is updated in the system of Facebook, the place or the location will be popped up on the users' iPhone when they are nearby or in the vicinity of your office or business. Using this they may visit the place and if you have set any event or offers, then they will really find that interesting to visit again and again. Such were the steps of creating "Facebook Places".